Risa: Imagine you're on a packed train in Tokyo. You want to get off but can barely move! What do you say? こんにちは。りさです. Risa here. 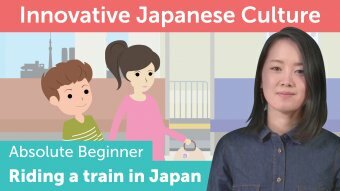 Anyone can learn how to ride a train in Tokyo. In this lesson, you'll learn how. Ben is on his way to his friend Taichi's house. Let's watch! Risa: Now with English translation. Man: The next stations is Shinjuku, Shinjuku. Ben: Excuse me. I'm getting off. Risa: Here are the key words from the scene. Alisha: Thank you very much. Alisha: In the scene, what did Ben say to offer his seat to the woman? Alisha: This phrase literally means "please." It's used any time you are letting someone go ahead of you to mean "after you." Or it can be used to offer something to someone, as in "here you are," like we saw in the scene. Now you try! Say Ben's line. Alisha: How did Ben get the people in front of him on the train to step aside so he could get off? Alisha: …which means “to go down,” “or to disembark.” You can use this word any time you're getting out of a vehicle. Alisha: Now you try! Say Ben's line to get out of the train. Alisha: Pregnant women often wear a maternity badge like this when they commute by train in Japan. This badge is given to pregnant women at stations or local city offices for free. They can easily show that they are pregnant, and get preferential treatment. Alisha: So, when you see a woman wearing the maternity badge, you might want to offer her a seat, like Ben did in this video. Alisha: Then other passengers will try to make space for you to get out. People standing near the door often get off for a moment and wait outside the train. Alisha: On the other hand, if you are the one standing near the door of a crowded train, be sure to step onto the platform when the doors are open so the people behind you can get out. Alisha: There are a few more manners you might want to know about when you get on a crowded train. Alisha: The first one is to hold your backpack in front of you, so you can control it more easily. Alisha: The next one is to be careful of your headphone volume. You don't want to bother other people around you with the noise from your headphones. Alisha: The last one is for men only- be aware of women-only cars. Some trains have women-only cars during rush hours. The women-only cars should have the stickers like this and are usually at one end of the train. Accidentally getting on a women-only car is one of the most common and embarrassing mistakes foreign men make! Risa: Now it's time to practice your new ability. Alisha: You're sitting on a train in Tokyo to go to Akihabara. Ready? Here we go. Alisha: You see an elderly man and want to give him your seat. What should you say as you stand up? Alisha: You've arrived at Akihabara, but you're stuck in the back of the train. How do you indicate that you'd like to get off? Which station in Japan have you visited the most? We are glad to hear that you like our lesson. Great to have you here and thank you for your positive feedback! We wish you all the best in your further Japanese studies and in case of any doubts, we're here to help! こんにちは。I think Japanese pod 101 is the best method of learning Japanese out of everything I’ve tried.I learn Japanese because I love the culture and food.Plus,it was the first foreign country I ever went to.I want to go back knowing real Japanese. I guess he is going back home by train.. right? You can say "私は日本の駅に行かなかった”. You didn't use train at all when you visited Japan? You can just say "すみません"(すいません) or "降ります" instead. When he wants to get off he said "すみません、降ります。", is it not too short to say in reality? It is as if he is in a hurry. Is there another way of saying it? 私はけっして日本の駅へも行かなかった。　＜is it mean, "I haven't gone to japan's station"